Action is a duty, but let not your ego crave the fruits of action, be not attached to either action or inaction. Ah, now you can really practice your yoga. For it is not about mastering any particular pose. Yoga is about being present in the action, in the moment, for the sake of the action itself, and NOT for any specific rewards that will be achieved as the result of an action. The other day I was trying to learn how to float up into a handstand, and then down into crow. Try as I might, I could not seem to raise up through that lovely pike position into a handstand and then settle down so that my knees rested lightly on my biceps. Soon I found myself obsessed with self-doubt. “I will never be able to do this. I am too old for this. I will never have a strong enough core…” And then thankfully, I was reminded that the only thing that really mattered was the effort in that moment. I needed to let go of the fruits of my actions. I won’t tell you that after this awakening I suddenly did find myself floating effortlessly through the air. No, but my practice did get lighter. The next day I came across the above cited verse, and breathed in relief. 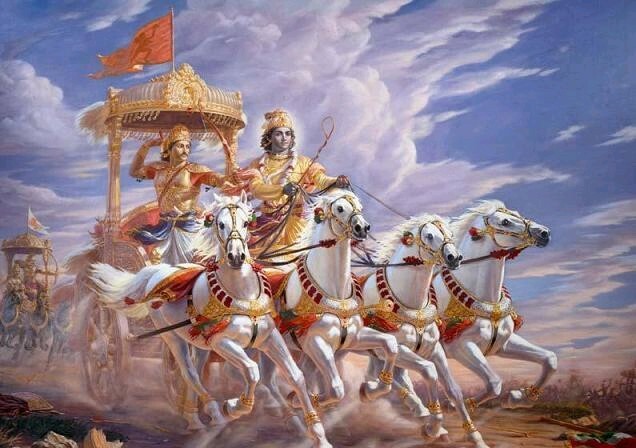 Even Arjuna, that mighty warrior, had to be reminded not to hold too fast to the results of his actions. We are here to live our dharma. There are many things we try and do, and the blessing lies in the doing. So, whether it is handstands, cartwheels, mountain climbing or other tasks like dishes and laundry and floors, remember to breathe into the moment and let the fruits of those actions be – without prejudice or celebration. This is yoga, living and breathing in this moment and the next. This is living your dharma.